Happy 2017, forex buddies! I’m kicking the year off by going with the flow on EUR/NZD since I’m seeing downtrend confirmation on the short-term charts. Take a look! The pair’s long-term downtrend is still very much intact as price is currently finding resistance at the top of its daily descending channel, which lines up with a major area of interest. Stochastic is heading south on this time frame, indicating that bears are taking control of price action. Zooming in to the 1-hour chart, I spotted a double top pattern, with price gearing up to break below the neckline at the 1.5000 major psychological level. 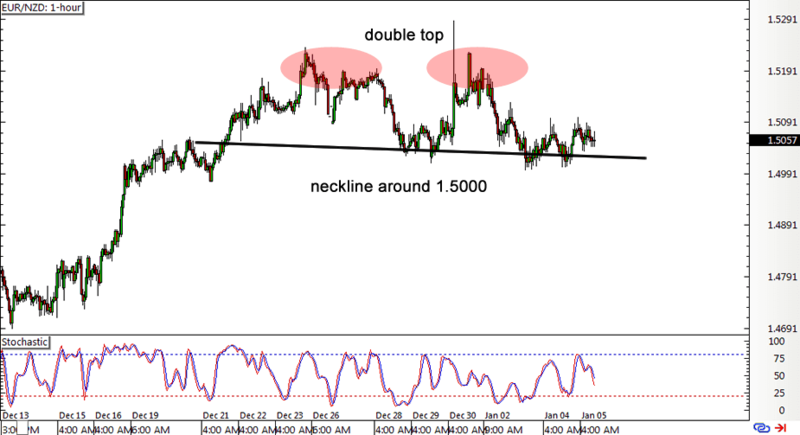 This could send price down by at least 200 pips or the same height as the chart formation. 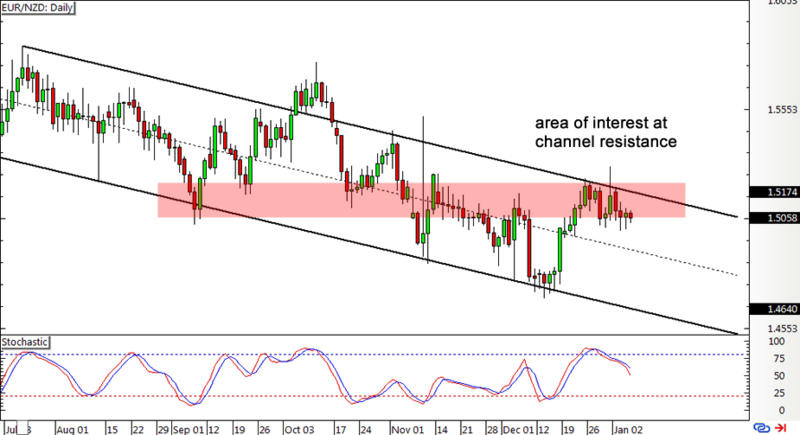 Heck, if selling pressure is strong enough, EUR/NZD might make it all the way down to the long-term channel support near 1.4500! I’m euro bearish mostly on account of all the uncertainties lined up in the euro zone for the next few months, particularly when it comes to the French and German elections. Brexit negotiations could also pose a risk for the bloc since kicking the U.K. out of the single market would hurt trading activity in the region. Besides, Italy ain’t out of the woods with its banking troubles just yet though the state agreed to bail out its largest lender, Monte dei Paschi. On the flip side, New Zealand has seen a lot of green shoots recently, printing a stronger than expected GDP reading for Q3 and likely keeping this momentum up for the last quarter of 2016. Even though the last couple of GDT auctions yielded declines in dairy prices, market participants seem hopeful that the industry can resume its rebound. Besides, stronger than expected PMI readings from China are likely to sustain demand for commodities and higher-yielding currencies. I’m looking to short on a break below the 1.5000 mark with a stop past the tops at 1.5200 and a long-term target near 1.4500 for a 2.5-to-1 R:R. As always, don’t risk more than 1% of your account on a single trade and make sure you read our risk disclosure if you’re thinking of taking the same setups. These are some of our favorite trading books, and BabyPips.com receives a small credit from any purchases through the Amazon links above to help support the free content and features of our site…enjoy! Trading currency crosses opens a whole new side of the currency markets, as different crosses possess different qualities that can suit any style of trading. Some crosses move fast and are extremely volatile. While other crosses move relatively slow and exhibit low volatility.